Remembering the twitchy, terrifying final days of communist rule in Czechoslovakia. 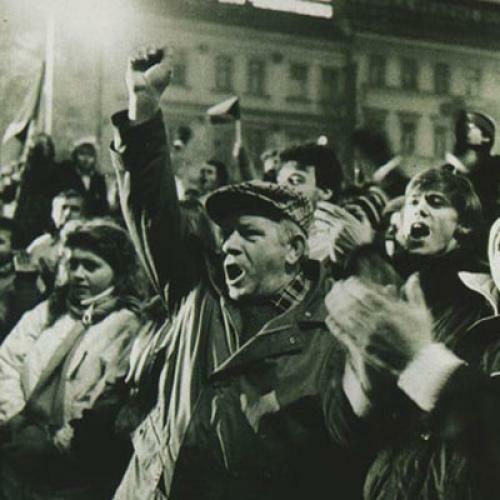 Thomas Omestad covered the Velvet Revolution in Prague for the December 25, 1989, issue of TNR. Read his piece here. The opening moments of what became known as Czechoslovakia’s “Velvet Revolution” did not feel so velvety. Nor did the outcome of those events--a largely peaceful triumph of the people over a stifling authoritarian system--seem certain. For those on the streets of Prague on the evening of Friday, November 17, 1989, it was easy to imagine a tragedy-in-the-making and perhaps a reprieve, of sorts, for a dying regime. The rosy glow of hindsight with which we remember the Velvet Revolution had not yet formed. Instead, Prague’s old stone streets became a warren of fear, rumor, and violence, as state riot police brutally clubbed student demonstrators. The students had gathered elsewhere to commemorate the 50th anniversary of the Nazi murder of young protesters, and then had marched into the city center. With many of the students cornered along Narodni Street, the police waded in with batons flying. The atmosphere of danger extended beyond the main police attack. A couple of blocks away, and perhaps an hour later, I heard a sharp, metallic bang just behind me on the sidewalk. A policeman, holding one hapless protester by his shirt collar and his belt, slammed him headfirst into the side of a bus on which other police sat at the ready. Hearing the bang, the police grabbed their batons and rose up to do battle. When they saw what had just happened, however, they broke into laughter and leaned back into their seats. Of course, within days, the laughs would be on them and their bosses, the once feared practitioners of repression so characteristic of East Bloc communism. I arrived in Prague on the 15th, for what emerged as the final days of a sad era. I met dissidents in smoky cafés, their eyes still darting about to scan for eavesdroppers. By the time I left days later, Prague felt something like liberated territory. Politics broke into the open as the suffocating fear lifted. He turned out to be right about that. The Czechoslovak opposition, led by playwright-dissident and later president Vaclav Havel, had long been faulted--even from within its Charter 77 dissident core--as incapable of offering a coherent alternative to the ruling Communists, let alone of mounting a credible strategy of protest and political pressure. The mostly Prague-based intelligentsia had failed to connect with workers and the young in general, who in turn tended toward apathy and passivity, it was said. Yet for all their seeming indecision, these battered yet stubborn dissidents had held on in the face of harassment and indignities, surveillance and prison time. “We were passing a small candle through the darkness,” Dienstbier had told me. By the 17th, however, the context had shifted. The Berlin Wall had fallen just eight days earlier. Democratic breakthroughs had occurred in Poland, through Solidarity, and in Hungary. Even in the USSR, Mikhail Gorbachev was undertaking reforms. In Czechoslovakia, an untapped popular zest for defiance emboldened the opposition to risk arrest, or worse. “The first ten days were very scary,” ex-dissident Martin Palous, now the Czech Republic’s ambassador to the United Nations, remarked to me this month. “We didn’t know whether to go home” and possibly be spirited away by agents of the regime, he recalled. The opposition feared a possible “hit list”--not a farfetched idea given that the government had previously hinted it would meet an earlier protest with a response like China’s bloody sweep through Tiananmen Square, just over five months earlier. To their credit, the Czechoslovak oppositionists did capitalize on the welling up of protest from the universities, forming a movement known as Civic Forum that channeled the demand for change and, in effect, pried Prague’s aging apparatchiks out of power. They got a lift from an unfounded rumor--that one young man had been killed in the police attack on the 17th. It took days to dispel the rumor, but it helped stoke popular outrage at a regime blamed both for clinging to brutal methods and rendering itself incapable of genuine change as the Eastern Bloc disintegrated. In a matter of days, hundreds of thousands of Czechs and Slovaks were gathering daily in Prague’s Wenceslas Square, where they saw Havel for the first time in person, addressing the throng from a balcony above the square. I watched from the next window over as the famously introspective playwright seemed at last to embrace his improbable destiny, in a kind of debut of his forthcoming role as leader of Czechoslovakia. Down in the same square, I got a reminder that the state’s thuggish security apparatus was still at work in those uncertain, early days. “You are in a dangerous profession,” a middle-aged man in the crowd spontaneously observed, having seen me interviewing others. I thanked him for his concern and offered to interview him as well. He turned away and slipped back into the crowd. Yet like all great events, the banality of ordinary life in Czechoslovakia coexisted in close quarters with the sudden thrust of history. As the protests grew, you could find Prague pubs near the square crowded, as usual, by mid- or late-morning as locals soaked up beer or wine and anesthetized themselves against their daily tedium. For some, the revolution could wait for another round or two. The combination of disgust from below, a newly vitalized opposition, and a dispirited, indecisive regime watching Communist control collapse around it proved serendipitous. “These revolutions were a wonderfully fragile constellation of circumstances,” Adela Gjuricova of Prague’s Institute of Contemporary History said recently. So fragile, indeed, that it would have seemed naively hopeful on that Friday night on Narodni Street to expect the breathtaking revolution that was about to follow. Thomas Omestad is a senior fellow at the Center for Transatlantic Relations at the Johns Hopkins University’s School of Advanced International Studies. *CORRECTION: The piece originally referred to Jiri Dienstbier as "the late Jiri Dienstbier." He's alive.